Yesterday, ECAL Convenor Jan-Aage Torp and his wife Aina were blessed to receive Scottish apostolic leaders Sandy Jamieson and Marshall Cross for a full day of relationship-building and strategizing. 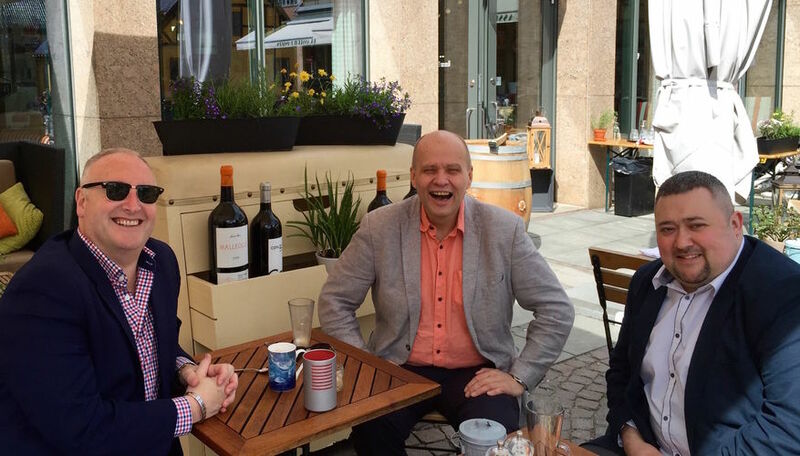 Sandy Jamieson, Jan-Aage Torp and Marshall Cross enjoying coffee at an outdoor coffee shop in downtown Oslo. The Scotsmen flew to Oslo for this one purpose. - We have known each other for two years, but this is the first time we have done this together, underscore Marshall (34) and Sandy (47). - It is well worth the time and money, because we want to grow in the apostolic ministry. We are emerging apostolic leaders, and the best way to learn is to connect with a seasoned apostolic leader. Sandy Jamieson lost his wife through cancer last year, and has three grown-up children. He has been the senior pastor of an Assemblies of God church in Dumfries, «Lighthouse Church Dumfries», south of Glasgow, since he planted it in 1994. He is also a businessman. Marshall Cross pastors Redemption Church in Wishaw, which is in the Greater Glasgow area. He planted the church seven years ago, and it is an independent church, even though he is well connected in evangelical-pentecostal circles. Marshall also ministers a lot in Uganda and USA. - The apostolic ministry is not big in Scotland, and we believe we should proceed with wisdom as we grow in these dimensions. There have been excesses through the years, and we want to build so that the apostolic can strengthen our Church and land, say Sandy and Marshall who believe that God is on the move in their beloved land of Scotland!